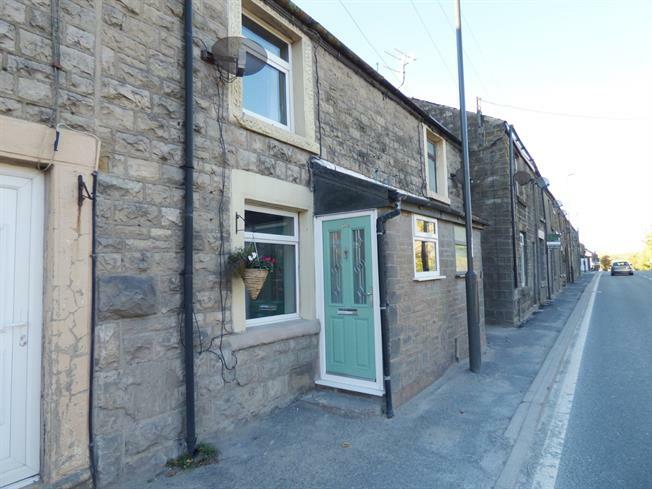 2 Bedroom Terraced House For Sale in Buxton for Offers in the region of £115,000. Offering accommodation including two double bedrooms and a recently refurbished bathroom and with a pleasant rear garden overlooking the adjacent countryside at the rear this stone built terraced property is ideal for first time buyers and landlords alike. A ground floor porch opens to the living room and a large dining kitchen with a rear porch/utility, with a useful cellar room to the lower ground floor, plus the two good sized bedrooms and stunning bathroom off the first floor landing. Other features include gas central heating and double glazing. Viewing is recommended. Double glazed uPVC window facing the front, double radiator, living flame gas fire with surround, picture rail and wall lights. Door to lobby with stairs to first floor landing and opening to the dining kitchen. Comprising wall and base units, roll top work surfaces incorporating a one and a half bowl sink with mixer tap and drainer, an integrated electric oven and a halogen hob with over hob extractor, plus space for washing machine, fridge and freezer. Double glazed uPVC window facing the rear, double radiator, door to utility and door to cellar. Space for a tumble dryer. Windows to side and rear overlooking the garden and a door into the rear garden. With light and ample storage space. Double glazed uPVC window facing the front, double radiator and built in wardrobes with mirrored door fronts. Double glazed uPVC window facing the rear, radiator and laminate flooring. Recently refitted and comprising a panelled bath with mixer tap, thermostatic shower over bath, a vanity unit with wash hand basin and a close coupled WC. Double glazed uPVC window with frosted glass facing the rear, heated towel rail, tiled walls and recessed downlights. To the rear of the property there is a pleasant garden area with lawn, timber shed and herbaceous borders overlooking the adjacent countryside.